Hudy's Cafe has been serving up local favorites for over 15 years. Our breakfast and lunch menus are full of hand-picked recipes inspired from family recipes and made with fresh, high-quality ingredients. 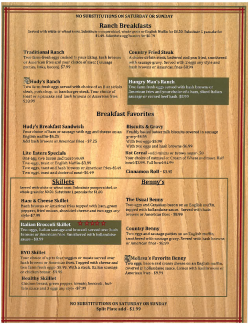 Try any of our most popular breakfast dishes such as the Italian Broccoli Skillet, Melissa's Favorite Benny or Everything Omelet, or venture into our lunch selection of fresh burgers, steaks, chicken and sandwiches. Whether you're dining with friends, family or alone, you're sure to enjoy our home-cooked meals, friendly service and comfortable, small-town ambiance. The cafe is open seven days a week, with monthly featured menu items. ©Hudy's Cafe & The Li'l Bar. All rights reserved.